OSWEGO, NY – Dominic A. Pennett, 96, a resident of Seneca Hill Manor, Oswego, and formerly of Deferiet, passed away Tuesday November 6, 2012. Born in Rossiter, Pa., in 1916, he was the son of the late Anthony Pennetti and Catharine Fera. He was educated in Rossiter, graduating from Rossiter High School in 1932. 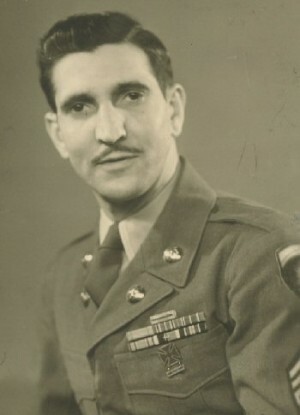 After a brief career in sales in New York City, he joined the United States Army in 1940. During his career in the military he served during World War II in Belgium. He was also assigned to Frankfurt, Germany, Captieux, France, Fort Ord, California, Fort Dix, New Jersey, Seoul, Korea, and Camp Drum, NY. He spoke proficient Bulgarian, French and German. He loved life in general and brought laughter to any situation. He loved being a prankster. His generosity was well noted as he loved giving things away…even if they weren’t his to give away. Classical music was a favorite of his. His latest passion was gambling, and he so enjoyed any trip to any casino. He enjoyed traveling and during the last few years he experienced a road trip to Texas and back, and California and back. Family was extremely important to him and he so loved getting together with them. He was predeceased be his wife of 62 years, Mae (Irwin) Pennett. Surviving are two daughters, Dr. Patricia (Jim) Sheahan of Pennsylvania and Mary (Milt) Slimmer of Oswego; and one son, Lt. Col. Dennis (Barbara) Pennett of Pennsylvania. He also has 11 grandchildren; eight great-grandchildren; and several nieces and nephews. Funeral services and burial will take place in Arlington National Cemetery at a later date. Donations will be accepted in Dominic’s name at Seneca Hill Manor, 20 Manor Drive, Oswego, NY 13126. Please note attention to the activities department. Anyone interested in attending the service in Arlington should call 315-343-4404 for further details.